Time to unfurl your body from that seat again. Open up the front of your body to make more room for breath, life and possibility. Take a nice long yoga break before you get back in the car! You'll want a park bench, planter, or even your bumper as a prop for this exercise. 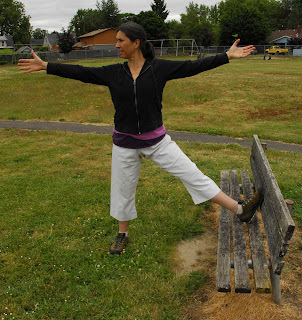 Stand alongside the bench and lift your foot up and out onto the bench surface. The leg will be extended to the side about 45 degrees. Turn your toes and your knee toward the sky. If your hamstrings are tight you'll want your lifted knee more bent than mine is in the photo. Lift and engage from your pelvic floor and abdominal muscles. Then spread your arms broad and open your upper chest. Take a few deep breaths. You can turn your head gently from side to side. Same pose, lacing your fingers together behind your back. Extend your arms and lift them away from your back. Lift your heart and upper chest. This is the 'chest expander' variation ~ so take some big full breaths and stretch out the front of your rib cage. Keep the back of your neck long and comfortable if you choose to turn your gaze upward. Lift the leg onto a higher surface to increase the stretch in your hamstring muscles. Continue to keep the toes and the knee facing skyward, the hips level, the abdominal muscles and pelvic floor engaged. You can twist your chest away from the lifted leg and lace an arm behind your back with the hand resting on your lifted thigh. Hold the pose for 4 to 8 breath cycles as you like. 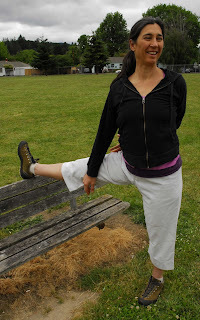 To add a side stretch rreach your arm down your lifted leg. You can catch the hand wherever it reaches while maintaining good alignment: knee, shin, ankle or foot. Keep turning your chest away from your lifted leg. Try to keep both the left and right sides of your spine equally long as you bend to the side. Use your drishti, steady gaze, to help your balance. Unlace the hand from behind your back and lift your arm overhead. Feel this stretch all the way up the open side of your body. Breathe into your extended waist and rib cage. Enjoy the pose for 4 to 8 breath cycles. As a final spine stretch you can arc the spine over the lifted leg (not shown). If the chest turns down toward the leg you'll enhance your hamstring stretch; if you continue to turn the chest upward (as if you were to lay your spine onto your lifted leg) You'll stretch the sides of the spine in the deep low back. Once you've completed the poses on one side of your body, repeat them on the opposite side. If you have time, do each side twice through. Then keep this energy of the opening of the front of your body when it's time to return to traveling.